IRENE ON THE WARPATH: Here the blow fell on Wiggins, one of Princetons most traveled streets. Similar scenes made transportation a serious challenge in the aftermath of Hurricane Irene. More pictures of the storm are inside. 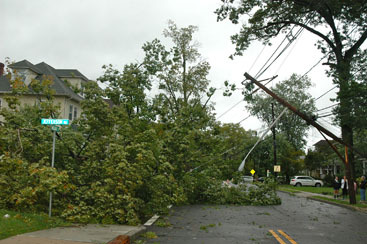 The soaking rains and howling winds of Hurricane Irene left Princeton with a monumental cleanup task. From fallen trees and downed power lines to flooded basements and clogged roadways, the storm created a mess for residents and the police officers, rescue and fire personnel who protect them. A volunteer with the Princeton First Aid and Rescue Squad (PFARS) died Sunday night from injuries sustained during an attempted swift water rescue. Michael Kenwood, 39, was trying to reach a car that appeared to be stranded by Greenway Meadows Park, near Rosedale Road, when he was separated from his partner and swept away by the current into an area of trees. Mr. Kenwood died at University Medical Center in Princeton shortly after 10 p.m.
Several days in advance of the August 30 meeting at which the Board of Education was supposed to announce which of two proposals it had chosen for the disposition of the Valley Road Building, the Board announced that it was postponing the decision until autumn. The areas ability to mobilize for various emergencies was put to the test in recent days by real and potential dangers. Most recently and obviously was Hurricane Irene this last weekend. Just days before, on Wednesday, an earthquake centered in Virginia was felt in Princeton and beyond, for several anxious-making seconds. Just a couple of days before that, the receipt of envelopes containing what appeared to be mysterious white powder was reported at not one, but two different Princeton locations on the same day. Pedestrians who cross against the light on Nassau Street at Witherspoon or Washington streets might find themselves face to face with an officer from the Princeton Borough Police in the near future. Starting after Labor Day weekend, walkers who opt not to wait for the Walk sign may be approached by police as part of an effort to make those intersections safer. The same goes for bicyclists who fail to observe the rules. When Princeton Magazines holiday issue arrives in mailboxes and on newsstands in a few months, the cover will feature the work of a budding local artist. The identity of that talented individual will be determined after Friday, October 7 at noon, which is the deadline for the Second Annual Princeton Magazine Student Art Contest. Anyone from New Jersey and Pennsylvania schools in grades 3-12 is invited to submit a piece of original art for the holiday issue. Antoine Hoppenot comes into the fall as a marked man for the Princeton University mens soccer team. Marvin Cheiten, who has brought a new play to the Hamilton Murray Theater in late August for the past several years, is taking a different route with his current production of Zenobia, a revision and revival of his original 2005 play. Rather than his usual local, modern setting, and his comedic style (often satirizing the murder mystery genre and the community of Princeton), with Zenobia Mr. Cheiten takes his audience to Asia Minor in the third century and the short tumultuous life of the warrior queen of Palmyra, an ancient kingdom in what is now Syria. Town Topics® may be purchased on Wednesday mornings at the following locations: Princeton  McCaffreys, Coxs, Kiosk (Palmer Square), Krauszers (State Road), Olives, Speedy Mart (State Road), Wawa (University Place); Hopewell  Village Express; Rocky Hill  Wawa (Route 518); Pennington  Pennington Market. Copyright© Town Topics®, Inc. 2011.